In today's data-driven world, we are surrounded by sensors collecting various types of data about us and our world. These sensors are the primary input devices for wearable computers, IoT and other mobile devices. 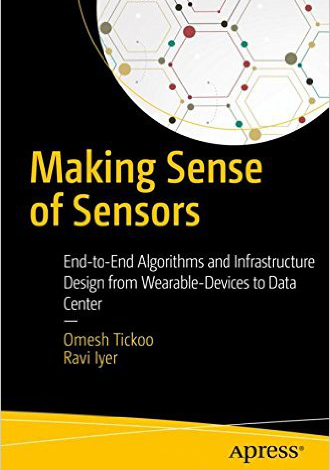 Professionals seeking to better understand today's sensor-rich devices and acquire knowledge and skills to develop innovative solutions that exploit them will be pleased to learn about the new book Making Sense of Sensors. Written by the team of Omesh Tickoo and Ravi Iyer, and published by Apress, the book is subtitled End-to-End Algorithms and Infrastructure Design from Wearable-Devices to Data Centers. Presented in a manner that permits readers to associate the examples with their daily lives, Tickoo and Iyer's book covers the most common architectures used for deriving meaningful data from sensors. This book provides readers with the tools to understand how sensor data is converted into actionable knowledge and provides tips for in-depth work in this field. Starting with an overview of the general pipeline to extract meaningful data from sensors, the book then dives deeper into some commonly used sensors and algorithms designed for knowledge extraction. Practical examples and pointers to more information are used to outline the key aspects of Multimodal recognition. The book concludes with a discussion on relationship extraction, knowledge representation and management.